The two areas that are currently served by Ritchie Park, that are being shifted to the new school, are much closer to the new school and not separated by a 12-lane freeway as they are now. Not sure what your pearl-clutching is all about. If it's so great, why are parents in that area complaining about the decision? Perhaps, but these parents' children also attend a school--Beall--that is overcapacity so it should not surprise them that neighborhoods in the southern end of the Beall service area are assigned to the new school. Let's also remember that the community vigorously advocated for this new school to relieve overcrowding at Beall, College Gardens and Ritchie Park. Alternative A left the new school less than 80 percent occupied, an outcome which would have rightly drawn criticism from taxpayers who are paying tens of millions for this project. Board members chose the best alternative available to them. What should concern MoCo residents is that the Board includes a voting student member, occupied this year by Matthew Post, who is not accountable to the taxpaying electorate. 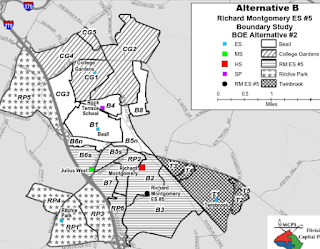 He was the only member who spoke favorably of Alternative D that would have resulted in costly and convoluted busing schemes to engineer a student demographic balance that he preferred, but the community overwhelmingly rejected. Thank goodness that members who actually face voters exercised more wisdom and sound judgment. Student members should be advisory only and not have a vote. So how would you have re-apportioned the school cluster, Mr. Dyer? Apparently you can only make accusations rather than offering solutions. Elementary schools in the neighborhoods so students can walk to school make the most sense. Large uncontiguous boundaries cost the school district (aka taxpayers) more money to bus kids around, longer times, and more traffic congestion. Overall I think this plan isn't too bad, it could be much worse. I know that there is a push to break up the Twinbrook area to spread the FARMS population around more, but it just doesn't make sense geographically with two major roads and the train lines on their boundary. Thanks for mentioning this. We went to these meetings at the BoE and they selected our second favorite choice (the first being most agreeable for our own interests). 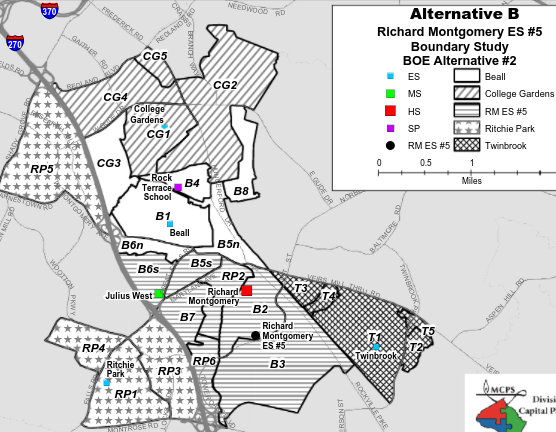 The first option (A), supported the most loudly by parents over most of the cluster, while geographically the most contiguous, resulted in still overcrowded schools and a low capacity at the new elementary school. This option still keeps things generally contiguous (to the detriment of some neighbhorhoods) but justified the full buildout of the school. Twinbrook, from what I hear, are happy with staying at their school, as a redistibution of students could result in a loss of federal funds and of course there are transportation challenges for lower-income families.